Did someone say “vacation?” With summer staring to sizzle and the kids out of school, chances are you’ll be hitting the open road sometime soon. Time to give your car an organizational tune-up! Keeping your car neat and organized will make your travels that much more enjoyable, so use these tips to get your wheels turning. Too much junk in the trunk? Get it under control with a folding trunk organizer. 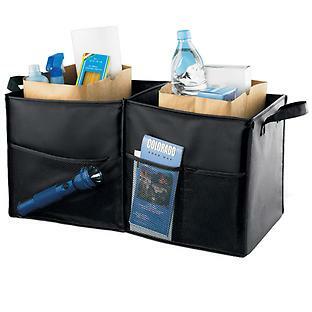 Not only will it keep your items in order, but you can fold it up and store it when not in use. This handy item will keep your trunk from becoming a catch-all for unnecessary items and lighten your car’s load (saving you gas mileage!). Keep crumbs at bay. Any road tripper is bound to get a few snack attacks while spending hours on the road, but don’t let your car pay the price. A small trashcan will keep your vehicle clean—and blissfully free of wrappers and food remains. Try this one, or this one. Kid-proof your car with the right tools. Idle hands are no bueno when it comes to maintaining a clean car, so keep the kids clutter-free and busy with this useful backseat car organizer. It allows you to easily compartmentalize everything from games to snacks, giving your kids distractionswithout the dirty mess. Safety first. Make sure you have all of the essentials in case you hit a bump in the road! Tops on your packing list should be: emergency flares, jumper cables and cell phone chargers (plus AAA on your speed-dial list).